Complete travel guide for Seoul - including fun things to do in Seoul! 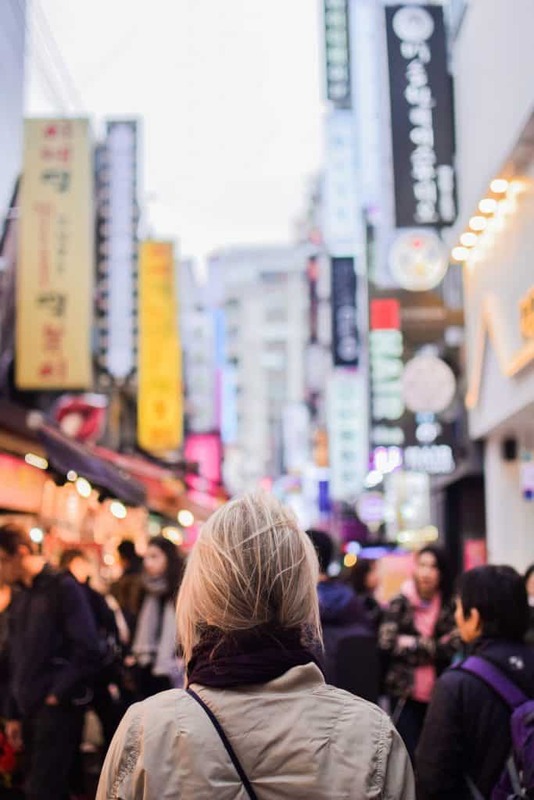 This complete travel guide for Seoul in South Korea contains everything you need to know about your visit to this amazing city. We are big fans of Seoul! We really fell in love with this urban beauty, and even think we could live there. During our trip around South Korea we have visited Seoul twice and had two long stays, and now we are ready to share our extensive tips. In this guide you can find some facts about Seoul, where to stay in Seoul, where to eat in Seoul, how to travel around in Seoul and 7 fun things to do in Seoul. Enjoy! Seoul is a city with a lot of history, as the capital has been settled over 2000 years and experienced a lot of warfare. During the Japanese colonisation in the 20th century, the name of the city was changed to Gyeongseong. During the colonisation, palaces were destroyed and the Korean culture was almost swept away. In 1945 Korea became independent and they changed back to the original name. Luckily, the Korean culture survived. When the city opened up to the outside world in the late 19th century it was the first Korean city to have railways and telephones. Since the 1960s, it industrialised quickly and it has become an economic giant center. Now, Seoul is one of the larges cities in the world, and has over ten million citizens. It is certainly an impressive city, with towering skyscrapers, modern architecture and lots of shopping possibilities. But in Seoul you can also find many artistic attractions, traditional palaces and temples, right in the city center. A lot of those skyscrapers are also hotels. Next we’re talking about where to stay in Seoul! This shot is taken at the gym of Lotte Hotels, right after we took a swim. 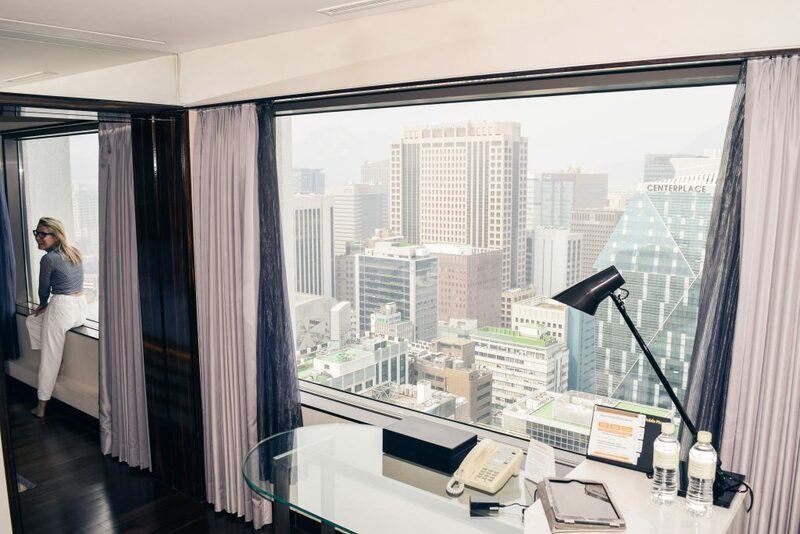 Lotte Hotels Seoul is a 5 star luxury hotel, located right in the heart of Seoul’s central business district. During our stay we could easily get to every place in Seoul, as the subway is only one minute away. This makes it very convenient to explore the city to the fullest. The interior of the rooms are elegant, tasteful and staying there is definitely comfortable. Next to a bedroom area, the Superior Room includes a seating area and working space. Of course, there is a spacious bathroom with a shower and bath. The best part of our room was definitely the amazing view we had over the city center of Seoul, with big skyscrapers in every corner. 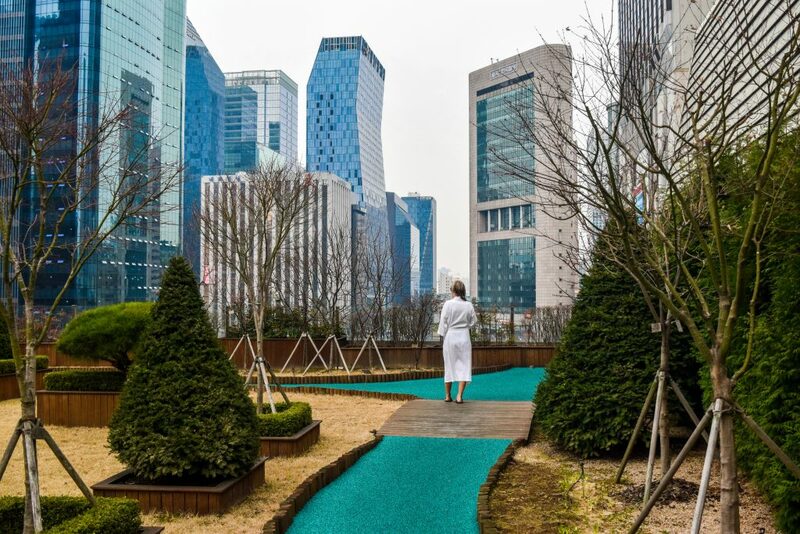 Lotte hotels Seoul offers different facilities, such as a Fitness & Spa. Here you can get pampered, take a dip in one of the pools or work out and loose those extra kilos of fried chicken. Furthermore, there is also a Lounge area, where we often went for some afternoon snacks. The breakfast is also amazing, with a wide variety of choices such as smoked salmon, eggs and much more. Another accommodation we recommend is L7 Hotels Myeongdong. We absolutely love this trendy and fresh boutique hotel. Like Lotte Hotels Seoul it’s conveniently located in the heart of Seoul, but it’s a bit more affordable and for a younger audience. The interior of this hotel is amazing, with various wall-art, quirky vending machines and comfortable seating possibilities in the main areas. The rooms of the hotel are spacious and comfortable, and the breakfast is sublime. 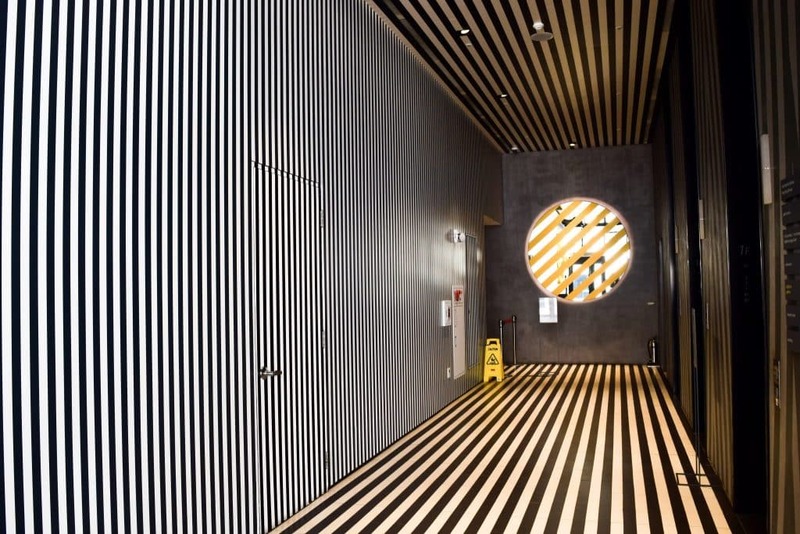 We already talked about L7 Hotels Myeongdong in our previous post about Seoul. If you’re on a budget, we recommend checking out accommodation on airbnb.We often use them in big cities, as they tend to be in great locations and are often reasonably priced. During our second stay in Seoul we found an affordable and comfortable apartment in a convenient area. It’s also a plus if they have a kitchen, that way you can buy some groceries in a supermarket or market, which is often cheaper than going out to eat. Also, sometimes it’s nice to cook for yourself, right? We could easily book it a few days ahead, but if it’s a busy season, we recommend booking an accommodation on time. If you haven’t used airbnb before, use our link and get €30 discount! Click here! Getting hungry? Let’s talk about food in Seoul next! Seoul is a heaven for meat lovers, and specifically fried chicken lovers, as there are more fried chicken places in Korea, than there are McDonald’s in the whole world. Which is quite unfortunate for me, as I no longer eat meat. There are lots of different Korean restaurants in Seoul and different types of food to try out. For instance, here are 10 street foods you should try out. Other than that, there are restaurants with cuisines from all over the world. Besides fried chicken places, there are really a lot of restaurants to go to in Seoul. One of our favourite areas was Itaewon. To be honest, it is a place where most tourists go, and Seoul even named Itaewon as its Special Tourism District. This area is a great place to enjoy culture, shopping and eating. Restaurants from Korea, New York, India, Thailand, Greece, Italy, Mexico and more can be found here. 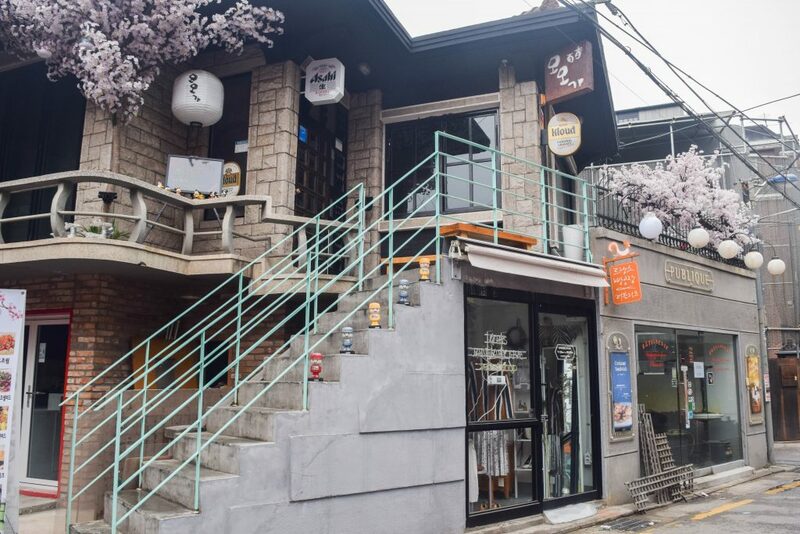 We recommend Itaewon if you’re looking for a wide selection of options! 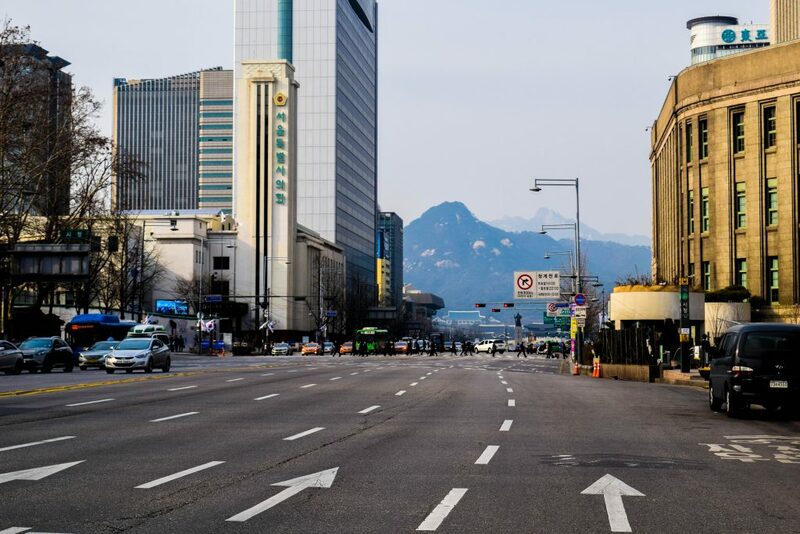 Seoul is huge, so it’s necessary to know how you can easily explore different parts of the city. Luckily, everything in Seoul is very well connected by public transport. 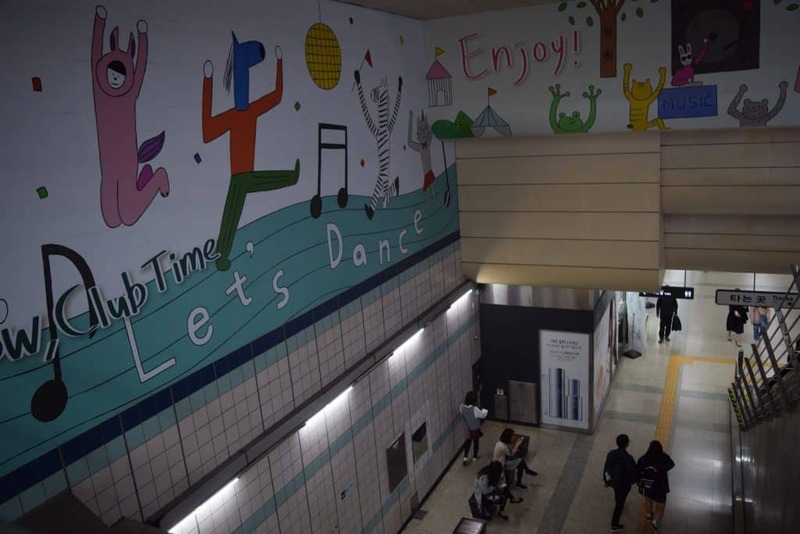 We mostly used the subway during our time in Seoul, so we will thoroughly explain how you can use this way of transportation in Seoul and what you need to access it. Furthermore, we will shortly discuss the other ways of getting around Seoul, such as the bus, taxis and renting your own car in Seoul. The thing that is great about the public transport in South Korea is that you use one card for every type of transport. Even for taxi rides! This card is called T-Money and can be bought and recharged at kiosks and counters at the convenience stores. Furthermore, you can also buy and recharge at machines located at the subway stations. The cost of the card is 3000 KRW and you can recharge whenever the balance gets low. In Seoul you also use the T-Money Card. We highly recommend getting a T-Money card if you’re planning to travel in Seoul with public transport a lot, and even more so if you’re planning to travel outside of Seoul too. Like we said, you can use the T-money card everywhere in South Korea! Of course, it’s possible to pay single fares and get a card called Single-Use T-Money Card. At buses you can also pay cash, but you have to pay the precise amount. Perhaps this is cheaper if you only use public transport one time. However, we recommend buying the T-Money Card. It’s easy and a lot cheaper too. Another possibility is the Seoul City Pass. With this pass you can board any bus or subway up to 20 times a day, regardless of the distance. Thus, this pass might be useful if you’re only traveling in Seoul for a very brief time but want to get around a lot with the public transport. Seoul Metro connects almost every part of Seoul together, making it a fast and easy way to travel around. We used the subway everywhere we went and we can tell you this: it’s modern, clean, fast, and it runs almost every three to five minutes. Therefore, we highly recommend using the subway in Seoul to get around. First of all, try to avoid rush hours in Seoul, as it can get pretty busy. These are from 8-9 am and 5-7 pm during weekdays. Even when it wasn’t rush hour, we usually didn’t manage to get a seat. Another thing to bear in mind before you use the subway in Seoul, is that the seats on the far end of each carriage are meant for the elderly. Those in the middle of the carriage are for anyone. When you enter the subway station in Seoul, tap your T-Money Card on the sensor at the gates and get in. Next to the sensor you can see two numbers. The top one tells you the cost of the fare, while the bottom one shows your balance. If you don’t have enough credit on your card, obviously you can’t enter. Finding your way around the subway in Seoul can get a bit complicated and overwhelming now and then. A few times in Seoul we boarded the wrong one – even once with our local Korean friend. But, it is definitely manageable to find your way around Seoul – it might just take a while to figure it out. You just need some patient! Luckily, everything in the subways in Seoul is in Korean and English. In addition, in each station there are signs for the exits, the transfers and the direction that the subway is heading. Every platform also includes line maps with the names of the next stops. Often the tv monitor screens in the subway tells you what stop you are at, however now and then it was only provided in Korean. Therefore, memorise the amount of stops you need or take a look at the line maps. When you exit the subway stations in Seoul, you have to tap out again, which is the same way as getting in. There are different applications for your phone you can use for the subway. We didn’t download any, but friends that live in Seoul all recommend using it for checking the schedule and finding short routes. 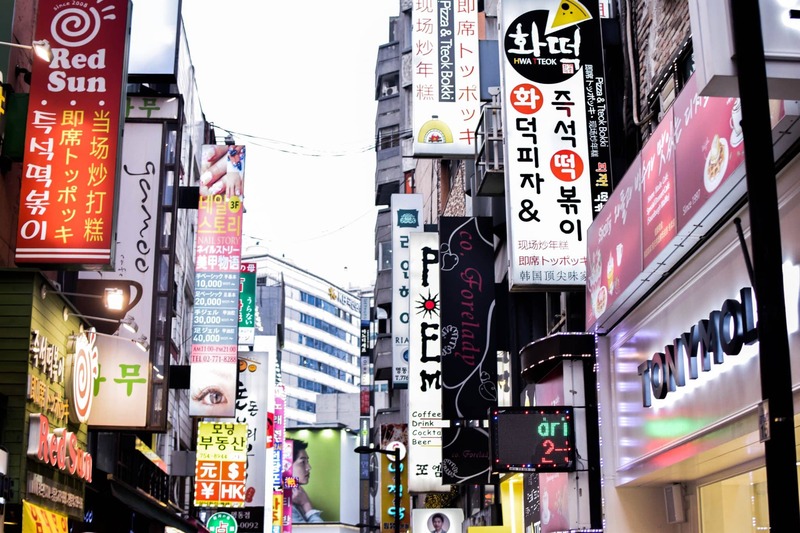 Check out this post with useful apps for living in Seoul, including an App for the subway. We barely used the bus in Seoul, as we found the subway to be the easiest way to travel around. But, just like the subway, the buses can take you to almost anywhere in the city. Furthermore, it does provide you with a possible nice view outside of your window. The majority of the bus drivers in Seoul don’t speak English, and pretty much everything was written in Korean and not in English. It is possible to use your T-Money Card in the buses of Seoul. Just tap your card on the sensor once you get in. If you don’t have enough balance, it is also possible to pay cash. It is possible to rent your own car in Seoul. Like everywhere in South Korea, you have to be at least 21 years old and have an International Driving Permit (IDP). Be sure to arrange before you leave your home country, as it’s often not possible to do so in South Korea. After doing some digging, we found that the price to rent a car starts from 60,000 KRW a day. Often you can rent a car at the airport, or at one of the local rental companies. It might be tricky to drive your own car in Seoul, even though we found the traffic very regulated compared to most Asian countries. But the safest option might be to rent a car with a driver. This is of course a bit more expensive and often you have to pay per hour. If you are interested in this, it is often possible to arrange it at your hotel. If you don’t want to use public transport and are thinking to get a car with a driver in Seoul, it might actually be cheaper to use taxis. Be aware that taxis are required to have a meter and use it. The fares are determined by distance and time. Many taxis accept payment via your T-Money Card and credit card, or of course cash. Taxis are a lot more expensive than public transport, but it is definitely a comfortable, safe and clean way to get around Seoul. There are a lot of fun and cultural activities in Seoul. Next you can find 7 fun things to do in Seoul. Gyeongbokgung Palace or “Palace Greatly Blessed by Heaven” once was the heart of the capital city of Seoul. After all the palaces in the capital were almost destroyed during the Japanese invasions in 1592-1598, the Gyeongbokgung Palace was left in poor condition. In 1867 it was reconstructed, but during the Japanese occupation the palace was mostly torn down yet again. Now, restorations have been going on to bring the palace back to its full glory since 1990. Gyeongbokgung Palace is Korea’s most famous royal palace, and it was definitely high on our list. The location of the temple is very convenient and easily accessible with public transport. It takes quite a while to explore as it is really enormous, so give yourself some time. 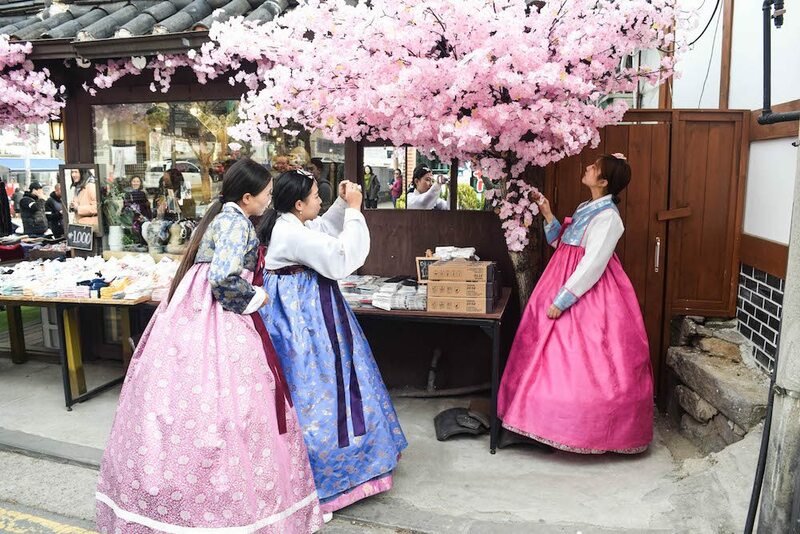 It is possible to go explore by yourself, but English tours are offered multiple times a day to learn more about Korean architecture and traditions. Changdeokgung Palace was the second palace to be built after Gyeongbokgung. After the Japanese invasions of 1592-1598 Changdeokgung was built and served as the main palace. Now, it is a UNESCO World Heritage Site and one of the most wel-preserved royal palaces from the Joseon Dynasty. The palace consists out of a public palace area where you can find houses, a royal family residence and the rear garden. The rear garden is also known as the Secret Garden. 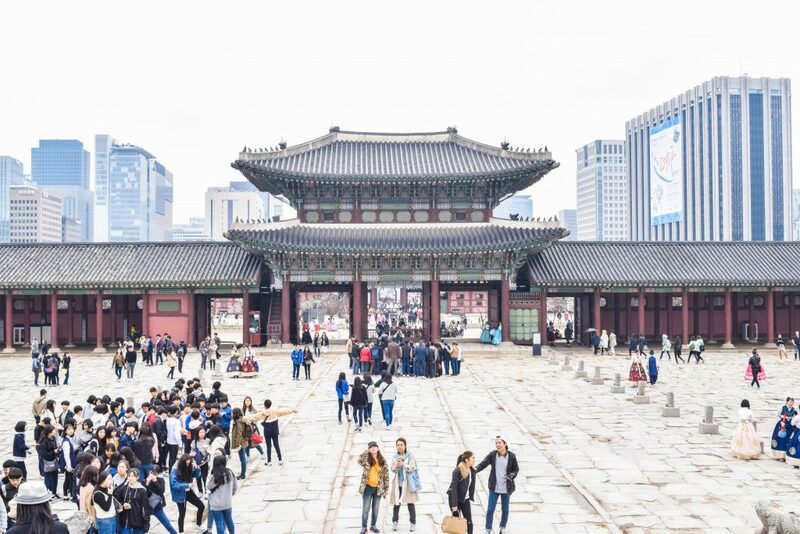 Just as Gyeongbokgung Palace, you’ll need some time to explore this gem. Both palaces are especially nice to visit during Spring, as there will be cherry blossoms around the compounds. This Buddhist temple is located right in the city center, making it hard to miss. On the grounds of the temple you can find beautiful trees that are about 500 years old. The main temple building, the Daeungjeon, is painted different colours. In addition, colourful and white lanterns are hanging around the building and trees. 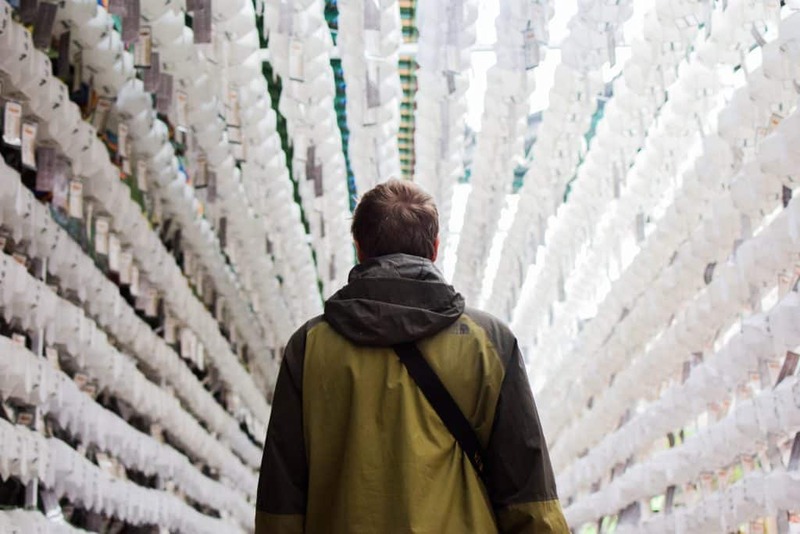 We highly recommend making a visit to Jogyesa Temple. Just a quick visit is possible, since it’s pretty small, and well, it’s free. Also, while we were there we got some free tea from lovely ladies that volunteered there. They wouldn’t take no for an answer! This is not particularly a specific activity, as it’s one of the primary shopping districts in the city. However, it is definitely fun going here to explore one of the busiest places in Seoul. Besides doing some shopping, you can visit this place at night to marvel at all the lights of the countless signs. Or, you can take a picture at the Line Friends Store with the one of the biggest teddy bears in the world! Furthermore, Myeongdong is known for having lots of street food stalls, so it’s a great opportunity to try out some of these. 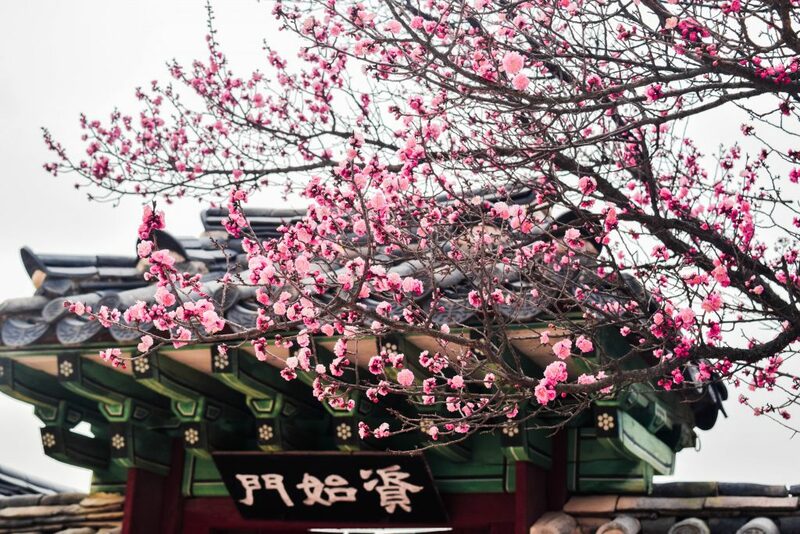 Visiting the Jogyesa temple and Myeongdong can easily be combined, since they are located close to each other. We just made a little day out of it and first went to the temple and afterwards went to take a photo with the giant teddybear, yay, and then tried some of the local street food. In the Bukchon Hanok Village you can find Korean traditional houses, called hanok. Bukchon is actually a real residential area and unlike most hanok villages, was not created for tourists. This does mean that you have to be respectful for the people living there, and signs indicate that you have to keep your voice down. It’s really a charming village, with the traditional Korean architecture and small hanok galleries, workshops and restaurants. 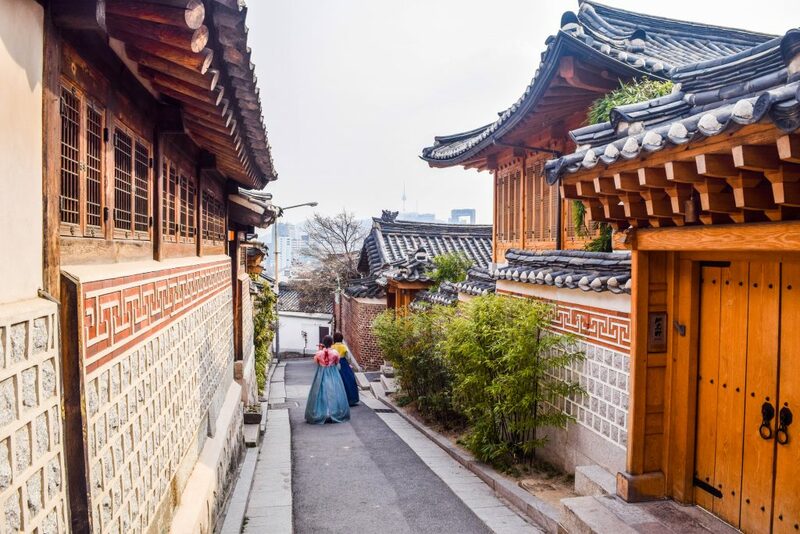 From the Bukchon Hanok Village, you even have a great view of the city in the background, creating a sharp contrast between modern and traditional. While we were in Seoul we caught up with our friend Kaitlyn Knoll from Wayfarerkate – pictured above. Together we went to an exhibition in the S-Factory of the Austrian artist Gustav Klimt. It was such a cool exhibition, but of course, this exhibition is only temporary. Unfortunately, tomorrow is already the last day of this show. 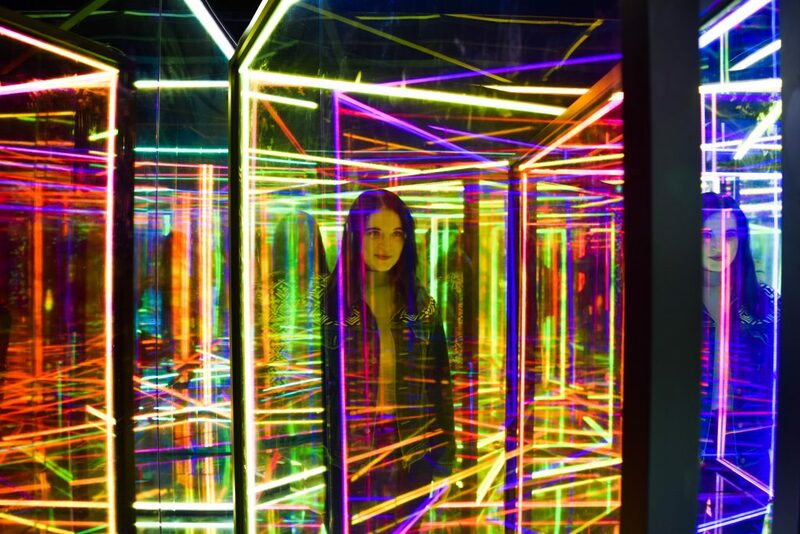 Fortunately, Seoul has lots of cool artistic centers and museums. Take a look at this list and this list for some inspiration. Also, be sure to keep an eye out for other cool exhibitions during your visit. We found the website TimeOut and there you can find the latest and upcoming art shows. From Seoul you can easily do a day trip to the Korean Demilitarized Zone (DMZ), which is the buffer zone between South and North Korea. Going here is surreal, as you learn a lot about the North Korean situation and history. Often you get the chance to speak with a North Korean defector and even set foot in North Korea at the border. Be aware that it’s only possible to go to the DMZ with a tour. Furthermore, it’s necessary to book far ahead to make sure you have a spot. There are several companies that operate various tours to the DMZ. 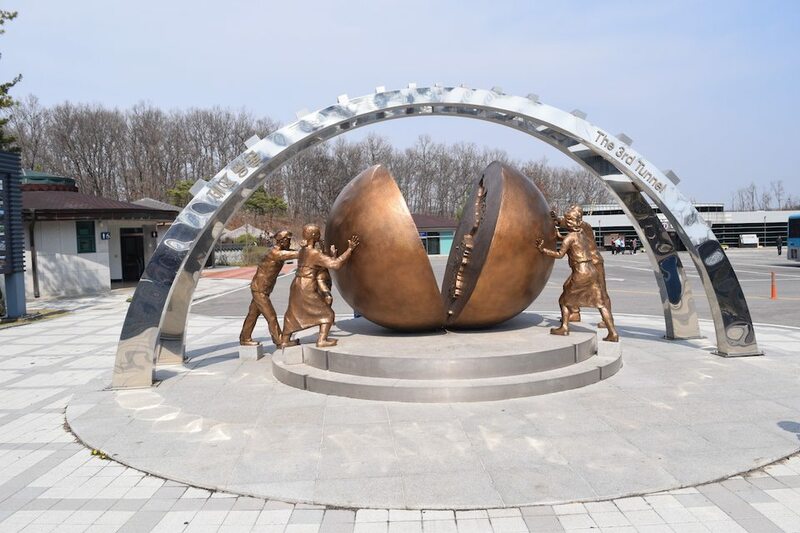 We went with the travel operator Panmunjom Travel Center and you can read about our experience in our article A visit to the DMZ with a North Korean Defector. There are so many fun things to do in Seoul. In our previous article about Seoul, we already described a full day of exploring. 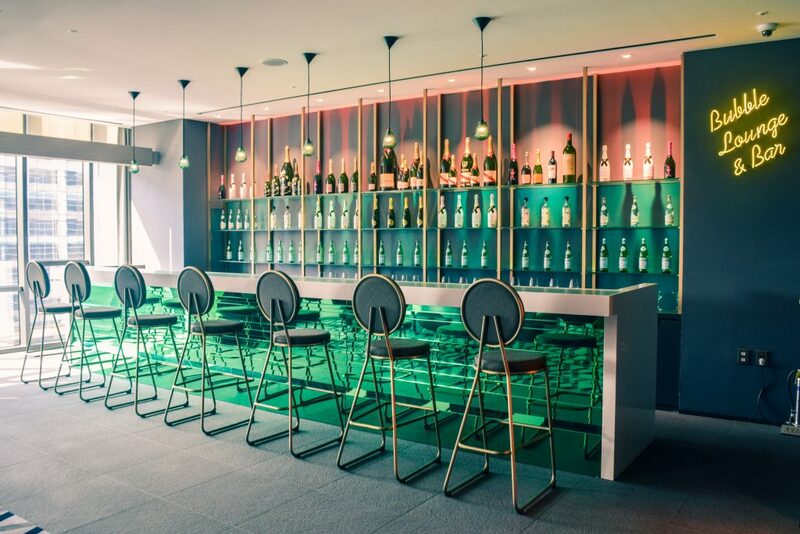 In that article we described the Jeong-Dong Observatory, Appenzeller Noble Memorial Museum, Deoksugung Stonewall Walkway, Cheonggyecheon Stream and the amazing rooftop bar and restaurant of L7 Hotels Myeongdong. These places are all worth visiting. Of course you can visit those spots separately too and not necessarily all on the same day. Also, why don’t you check out TripAdvisor for more fun activities in Seoul? We hope you find this article useful for your visit in Seoul! There are enough fun things to do in Seoul, so you’ll have an amazing time! If you have any questions or comments, drop a message below or e-mail us via the contact form on this website. Seoul looks so gorgeous! 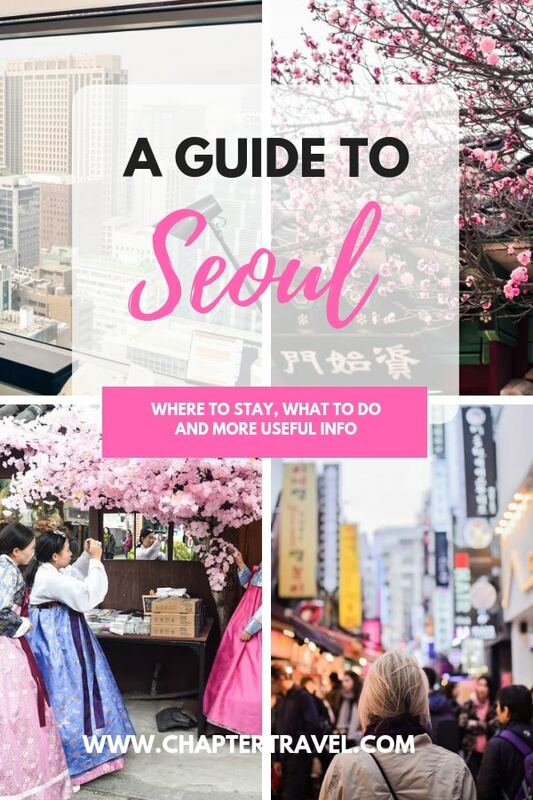 This was such a perfectly timed guide, as I’m thinking about booking a flight that includes an overnight layover in Seoul! Loved this guide! South Korea is definitely on my list! Do you recommend any day trips from Seoul to any other areas? How many days in total do you recommend for Seoul? Seoul seems like such an incredible city and I’d love to visit! Thank you for the detailed, informative post! Really thorough and helpful post! I can’t wait to visit Seoul one day! It looks and sounds fantastic! Thanks for the amazing guide! We lived in Korea and still didn’t know about many of these! We did live in the south closer to Busan, but still! Thanks for the post! Whaaaat! Haha! That is insane! I really loved the Lotte hotel in the city centre with the pool. Would you say the city, with more than 25 million peeps, is polluted? This article was extremely helpful! I am planning to visit Seoul in a week and these gave me some very good tips, thanks for sharing! Little did I know when I read it that I’d be booking tickets there a few days later! Wow what a detailed guide and I love the photos taken! Such a great cliff notes guide! I totally saved this for later as we are hoping to go next year! Thanks for sharing! I have a conference in Seoul this September and I am SO excited. Thanks for this awesome guide to the city; I will definitely be using alot of this to check stuff out. This is a really helpful post! I’ve been looking into South Korea as a destination a lot lately, so this post came just when I needed it! I love reading guides that include airbnbs. So often its only hotels in guides, and I am more of an airbnb girl. I am hoping to go to Seoul with my bf some day, as he lived there before and wants to show me around. Love this guide, saving it for later use! Everyone thinks I’m crazy for wanting to visit the dmz 🙂 glad you were brave enough to do it! Very compehensive guide! Thanks Lauren! The DMZ is quite an extra-ordinary place..
Inspiring photos, after reading your article I feel ready to book the tickets to Seoul! I’d love to visit the temples, palaces, and of course DMZ. Yay, so sweet Nina. Thanks! Everything seems so beautiful in Seoul, I enjoy reading your article, it’s very informative. Thanks for sharing. Great info! Trying to figure out all the details and logistics is one of the most difficult things when planning a trip. Looks like a fantastic place! Thank you :)! so true! Hi Vibeke! Thank you so much, glad you like it! Thanks Chloe! Hope it is of great use!